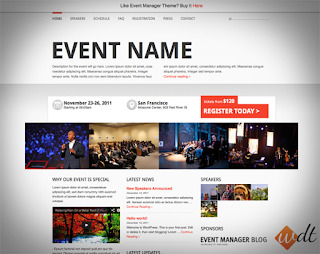 The most popular layout design used for event websites is the vertical layout. It allows users to scroll down, without leaving the page. All other elements, such as links, contact information can be added on top or bottom of the page. Event websites are usually single-page websites, mainly because there is no much contact that needs to be broken down into categories. All it takes to advertise an event is to share the date of the event, the venue and speakers and participants, especially if we’re talking about notorious persons. With the way people are accessing Internet today, it is important to make the event website design mobile friendly to ensure wide reachability across different mobile devices. Make sure that the website looks good on any screen size, that the content is readable and that all elements look good. Whether it is a workshop or a conference event website, they are all marked by the presence of notorious people. Make sure you put emphasis on the speakers that will deliver speeches during the event, as many people consider attending one or another event just because of them. Provide detailed information about the guests and explain the reason they have been invited to speak before attendees. Many events are held annually and have already established a brand image. Usually, the event has a logo that appears both on the website and print materials, like flyers, brochures and banners. A good logo design helps to convey the event’s message and to build brand recognition. The reason you try to drive visitors to your event website is to increase registration. For this, make signup feature easy for users. Insert a simple registration form which can be filled in quickly. Don’t ask people to provide too much information as this can scare them off. The signup button works as a call-to-action button, therefore make sure it is designed to be easily recognizable without understanding the language. Read Button Design techniques to Improve User Experience for insights on how to design buttons that converts. If you’re designing an event website design these tips can help you see the bigger picture and make your work more efficient and visitor-oriented. Use them to craft an amazing website design that will attract new visitors and convert them into attendees. What do you think of the tips we’ve detailed? Do you have any others that can be added to the list? Share them with us in the comments section below.